Chesterfield’s hunt for a new striker is ‘ongoing’ but they might have to wait until January to find someone who would improve the squad. 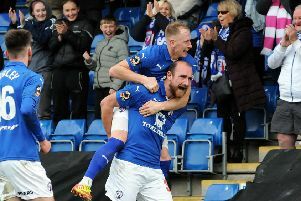 The Spireites’ woes in front of goal are evidenced by their goals for column – the joint worst in the National League. They’ve fired in 16 in 20 games and before Tom Denton’s Tuesday night heroics, Marc-Antoine Fortune was top scorer with four. Manager Martin Allen has been given funds to add to his options and is searching high and low. “It’s on going,” said Allen. “But we’ve got to find someone better than what we’ve got. “The owner has made money available. We’ve had one, big bid turned down. There’s no chance of that deal happening now. “We’re looking at other players but at the moment we’re being knocked back left, right and centre. “So we’ve got to continue with what we’ve got. “We’ve been well organised, well disciplined, difficult to beat, but then the final part is knocking the goals in. The January transfer window may create movement, with clubs further up the pyramid farming players out to create space for new ones. “The loan market opens up for the Premier League in January,” said Allen. “We’re looking at all options for loans, loans who have done well from clubs higher up, we’ll look at all different markets.